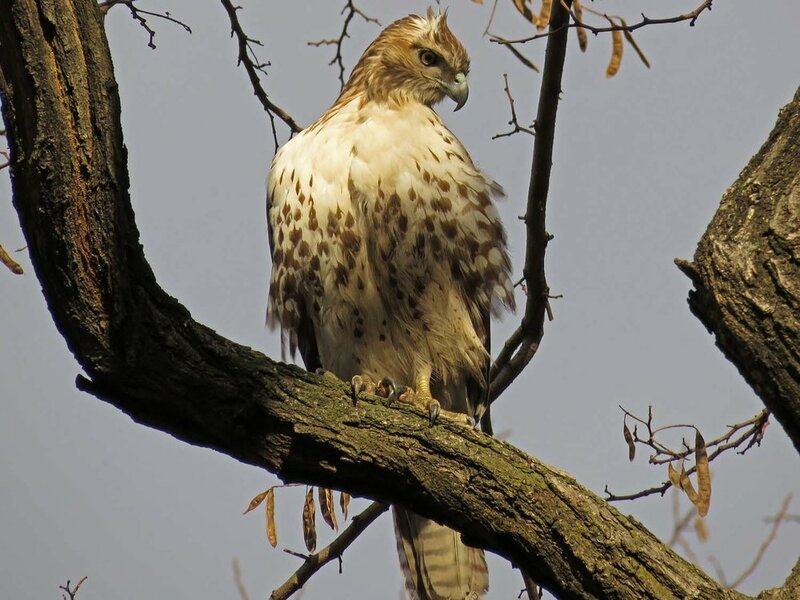 I hope this page will detail the red-tailed visitors we see in Central Park who we don't think are Pale Male's offspring. I have split the entries into two pages, this one and Red-Tailed Hawks 2, because it was taking so long to load all the photos. 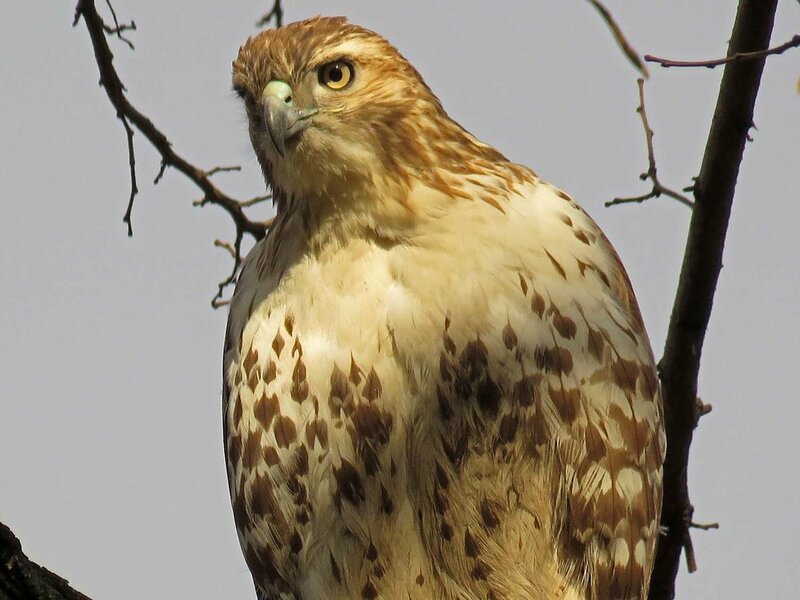 Note that there are separate pages for Pale Male and his family, Fred and Ginger, the west-side Central Park pair, the Riverside Park hawks, and the Tompkins Square Park hawks. 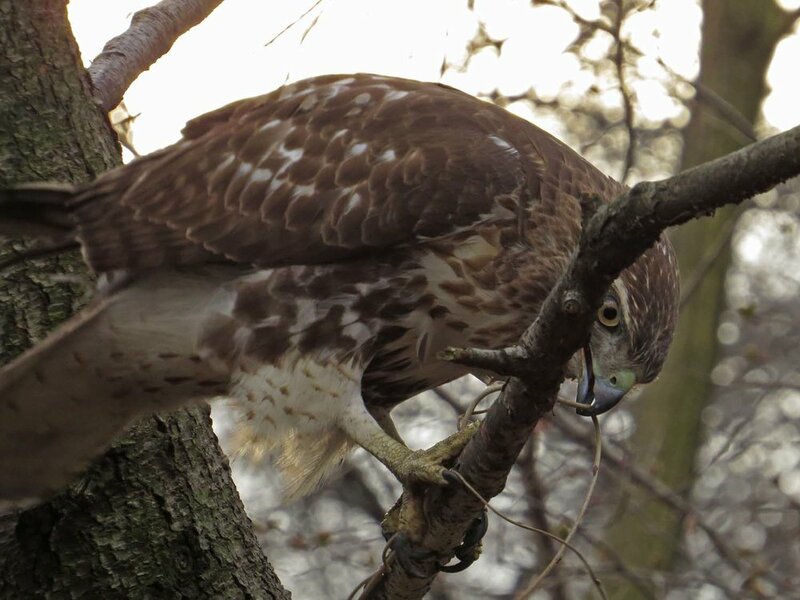 While there are videos on this page, I'm trying to consolidate the red-tailed hawk videos into the Hawky New Year video page, which includes videos from 2017 and the winter red-tails of 2018. You can binge watch red-tails! 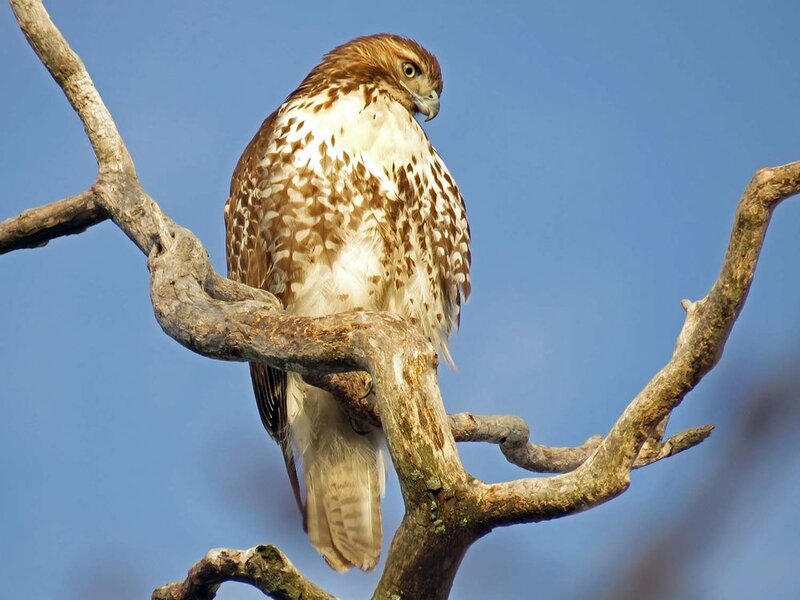 This adult red-tailed hawk was seen on Governors Island on October 7, 2018, guarding a squirrel on a nearby branch. The bird sat for a while (first photo), and later was seen eating part of the squirrel and then resting (second photo). 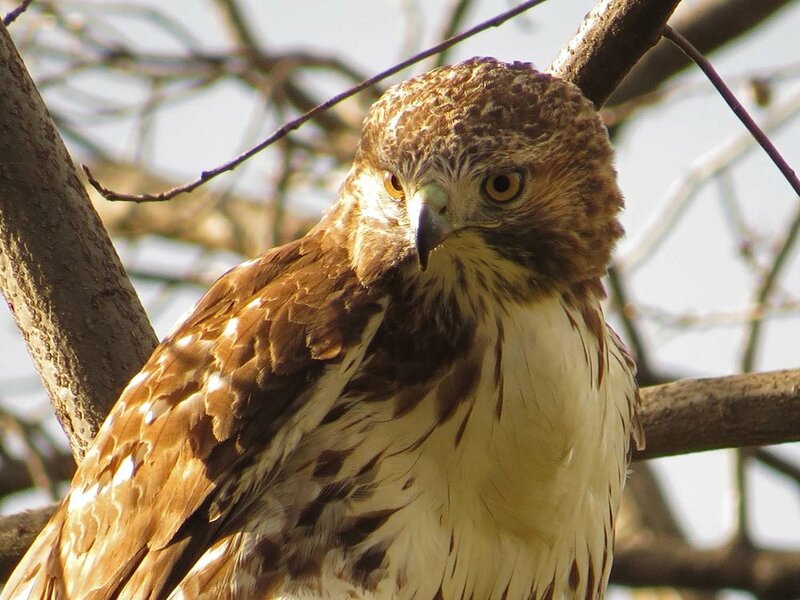 Two first-year visiting hawks were seen hunting near the playground at 100th Street and near 96th Street on September 22 and 23, 2018. 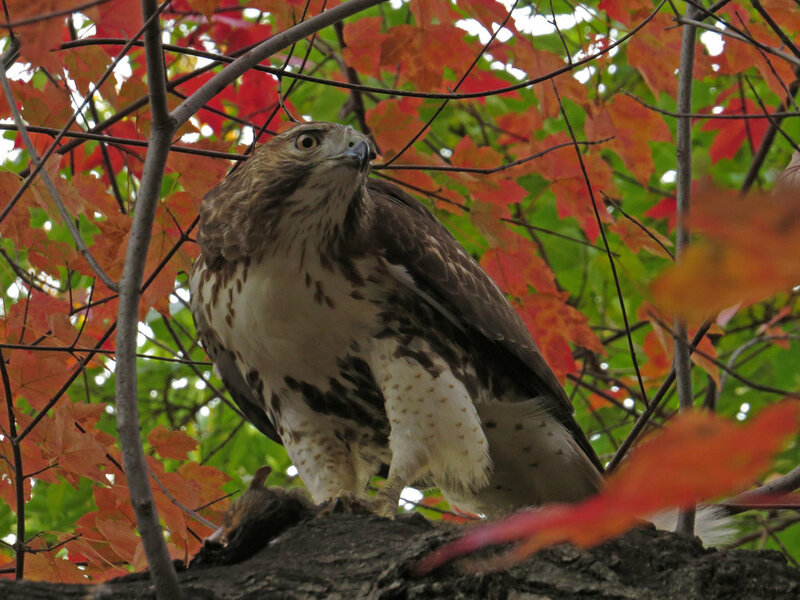 A first-year red-tailed hawk visits the playground at 100th Street in Central Park, September 22, 2018. More hawks for the Chasing the Hawks series, these from winter 2018 (see Hawk Fights, below, for additional photos and videos of the winter hawks from 2017). 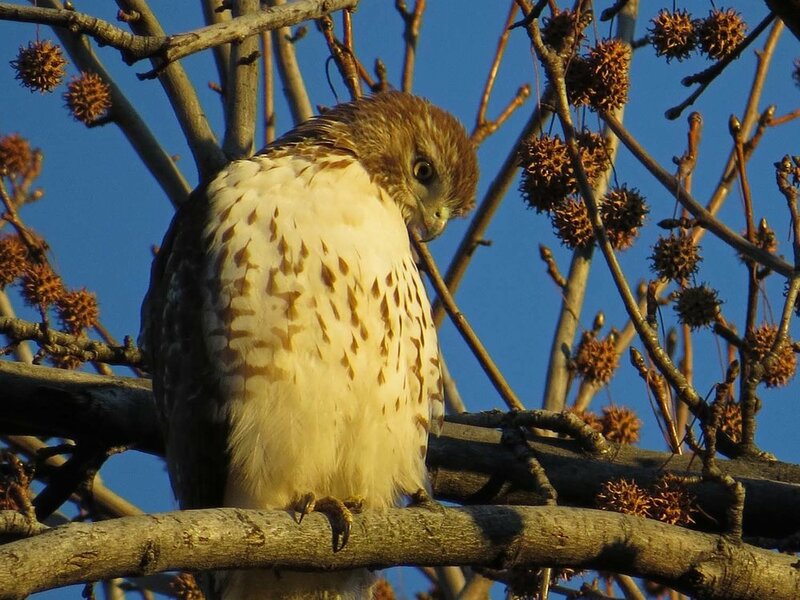 The juvenile hawk we saw at Stateline Lookout on January 18 was quite striking in the sun. The juvenile photographed on January 20 (Victoria, perhaps? see below) was quite photogenic. 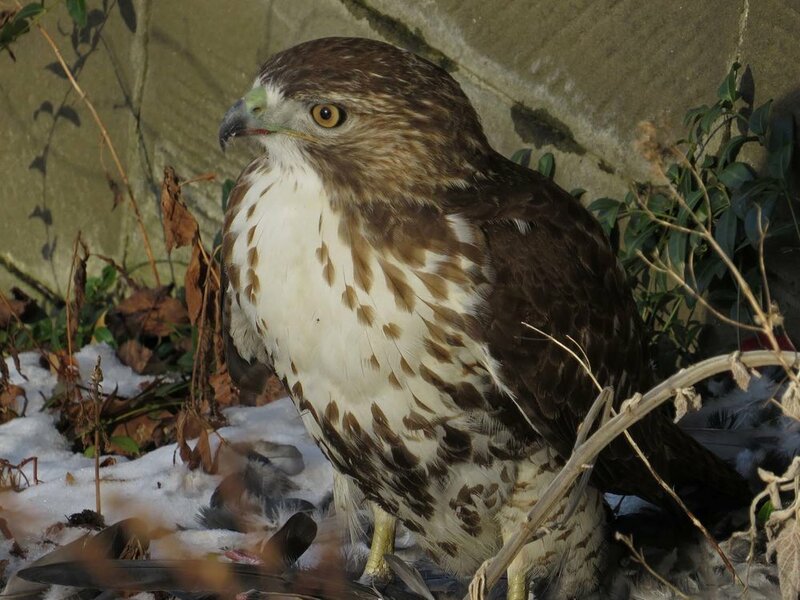 This juvenile red-tailed hawk caught a pigeon near the Falconer statue on February 1, 2018, and ate it just north of Sheep Meadow. 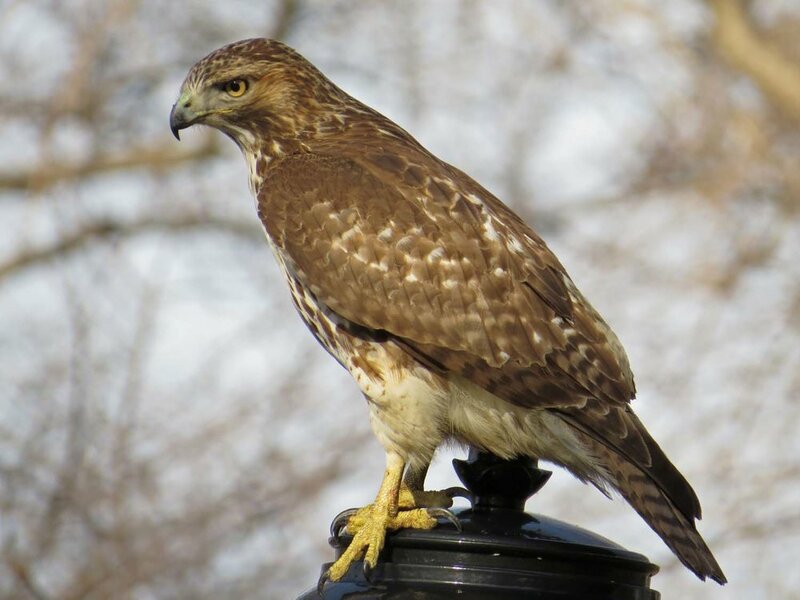 (I think this is Victoria, the hawk featured below as the victor in the Battle of Bethesda Fountain. This juvenile red-tailed hawk did not seem happy sitting in the rain. 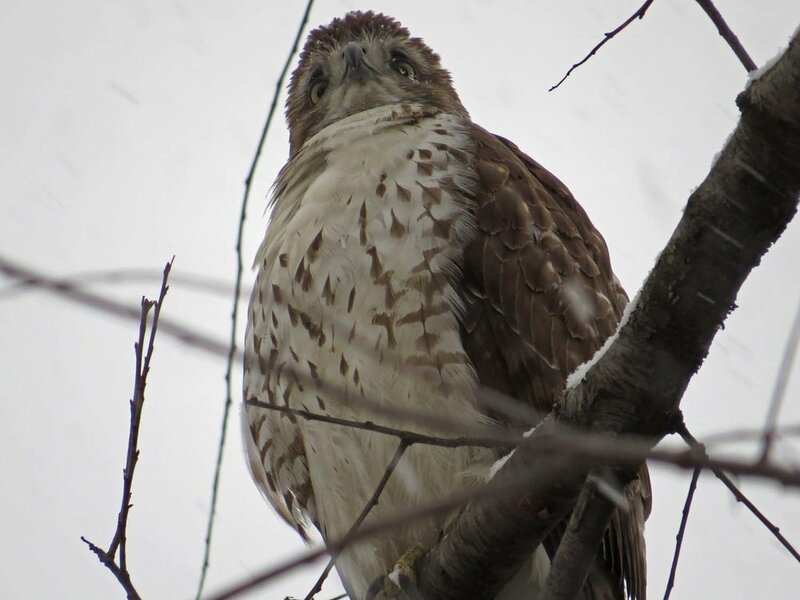 A visiting adult hawk hung out on February 18, 2018, just south of the Reservoir, in Pale Male's territory. The hawk managed to take in the sun without getting chased out for a couple of hours. 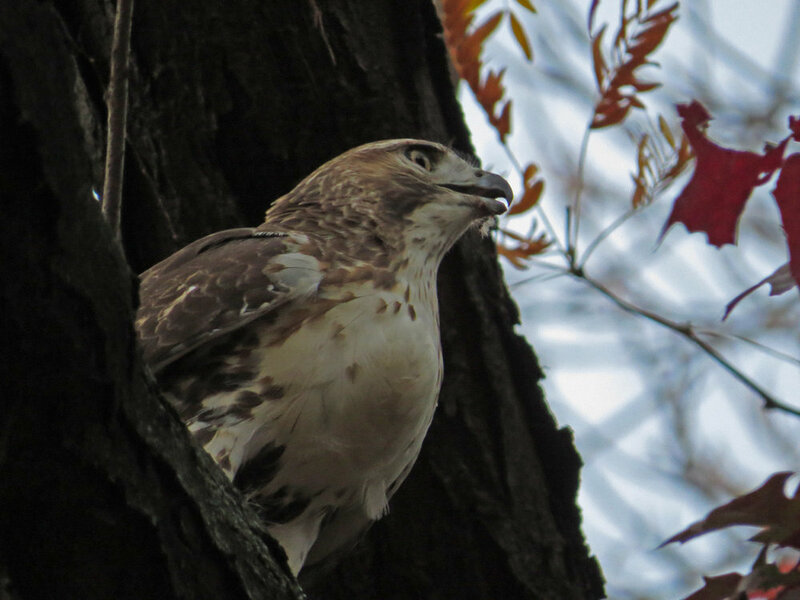 It's winter, and time for visiting juvenile red-tailed hawks in Central Park. In 2017/18, we've had several youngsters coming through, trying to establish themselves. Sometimes they fight with each other, or the resident adult hawks knock them off their branches and chase them out. 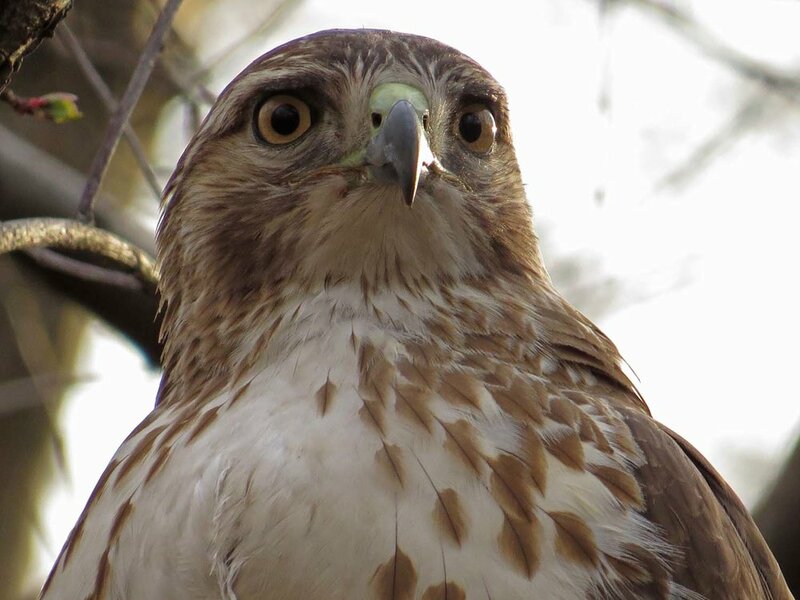 On Christmas Eve 2017, we were following a first-year hawk as he hunted and flew around the Bethesda Fountain area. We called him Stretch because he could really stretch his neck up to look around. 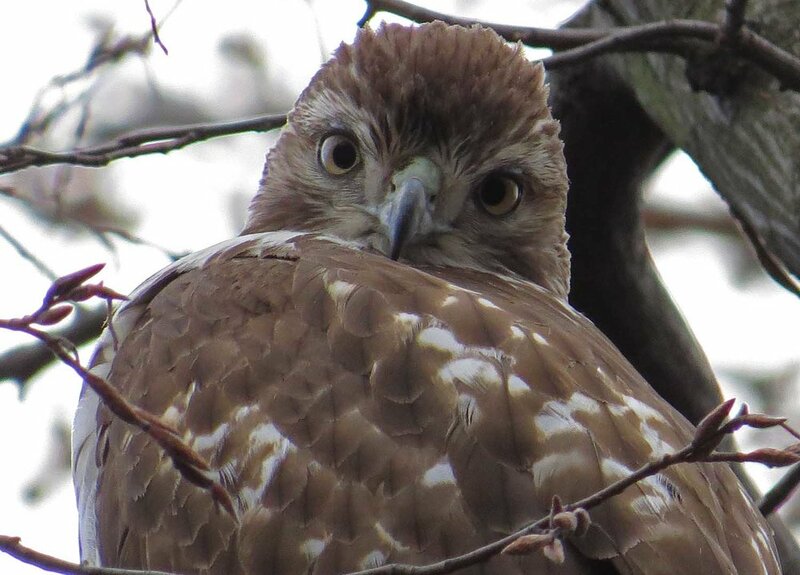 While stretching that neck perched on a branch of a tree just west of Bethesda Fountain, he was smacked by another, larger first-year hawk. Thus was the first Battle of Bethesda Fountain. After the fight, Stretch flew south and the winning hawk surveyed her realm from a tree on the east side of the fountain. The following photos were pulled from the video, which you can see below. The victorious young hawk we named Victoria, and we followed her that evening and for several days after. On Christmas Day, we followed Vicky around the Bandshell/Bethesda area. She was hunting, and her Christmas wish was granted in the afternoon: a squirrel dinner. I put together another video, called Ho! Ho! Hawks!! !, which covers December 25, 27, 29 and 31. Most of the video shows little Victoria, and there is graphic footage of her eating a squirrel and a rat. I tried to cut it down a bit, but it is interesting to watch how she keeps looking around to protect her meal while eating on the ground (the squirrel was too heavy to fly to a tree). 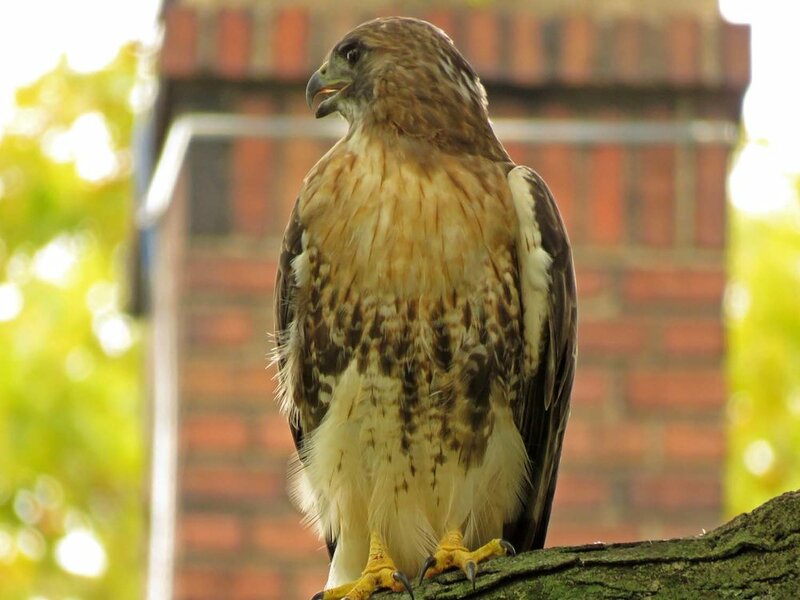 There is a brief look at Fred, the West Side adult red-tailed hawk that believes Bethesda Fountain is his territory, looking down before chasing the kid. After New Year's Day, we saw Victoria on January 5 and 7. 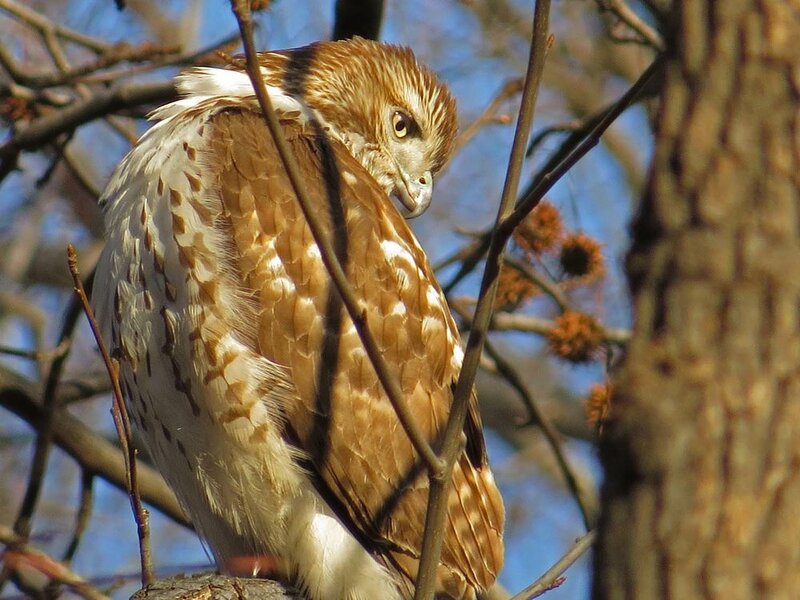 On the 7th, she was first near Strawberry Fields, where Ginger, Fred's red-tailed mate, was perched in a pine tree staring at her. 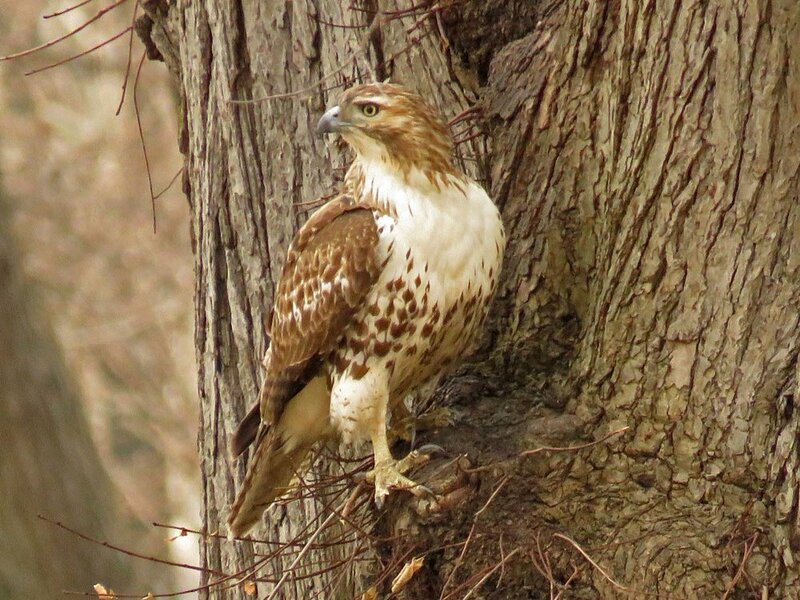 The youngster flew east, but then flew to Cherry Hill, where Ginger chased her out. After more attempts to return, the youngster went after Ginger, and would probably have kept fighting if Fred hadn't swooped in and chased her off. Two kids fighting? Victoria wins. Victoria tag-teamed by two adult hawks? The adults, no question! Fortunately, I was able to film part of the battle. March 26, 2017, was a fun day with two first-year red-tailed hawks around 100th Street in Central Park. The first hawk was eating pigeon in a tree. The second hawk chased squirrels for a while, flew to Central Park West to hunt pigeons among the cars, buses and trucks (and to perhaps apartment hunt a condo? ), then returned to the park and finally caught a squirrel just west of the tennis court. The squirrel was too heavy to lift, so the youngster stood on it on the ground for a while, then ate about half, and then stood on the meal some more. After two and a half hours, the hawk was chased by an off-leash dog into a nearby tree, where more time was spent waiting for a chance to retrieve the meal. The video, Separate Tables, was filmed in between screaming at people to keep away from the hawk or keep their dogs away and convincing other people that the hawk wasn't sick, but just trying to eat in peace. 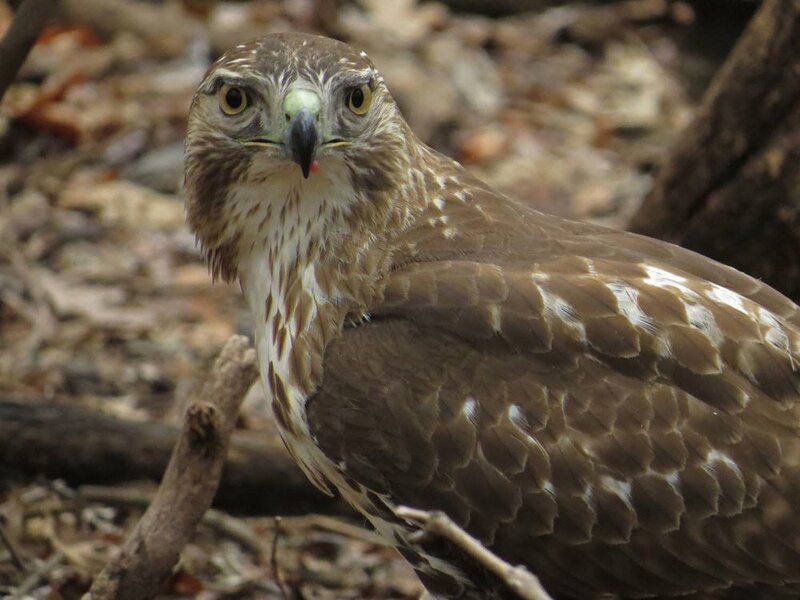 These photos show the first hawk, with the pigeon. Our second first-year kid is seen here at first in between trips down to the ground to chase squirrels, then on Central Park West looking for condos and pigeons, then back in the park with a squirrel on the ground. The final shot shows our youngster in a tree after being rushed by an off-leash dog. 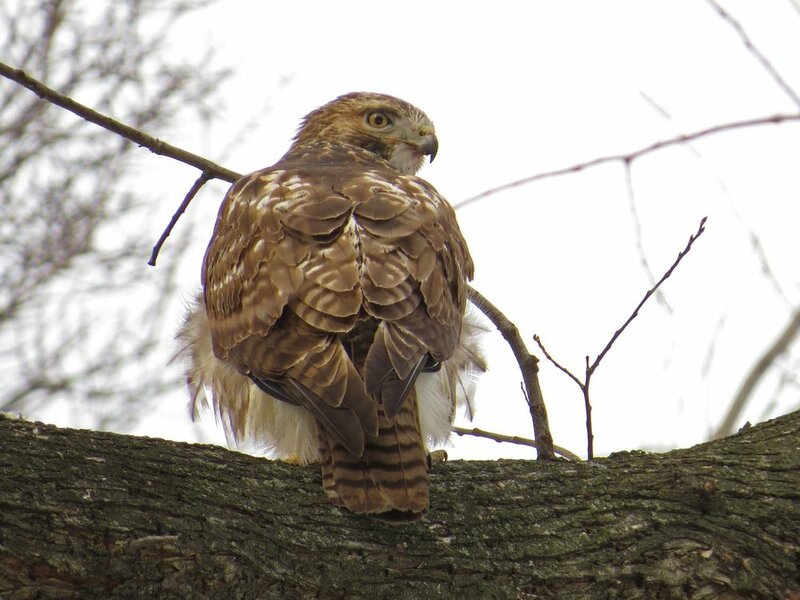 We chased a first-winter red-tailed hawk for a couple of hours on March 1, as the youngster perched low on branches, chased squirrels and missed, caught some bark on the ground, flew all around the Ramble, then flew to a tree and grabbed a squirrel out of a hole. You can read about it in the blog, and see the video here and the photos below. 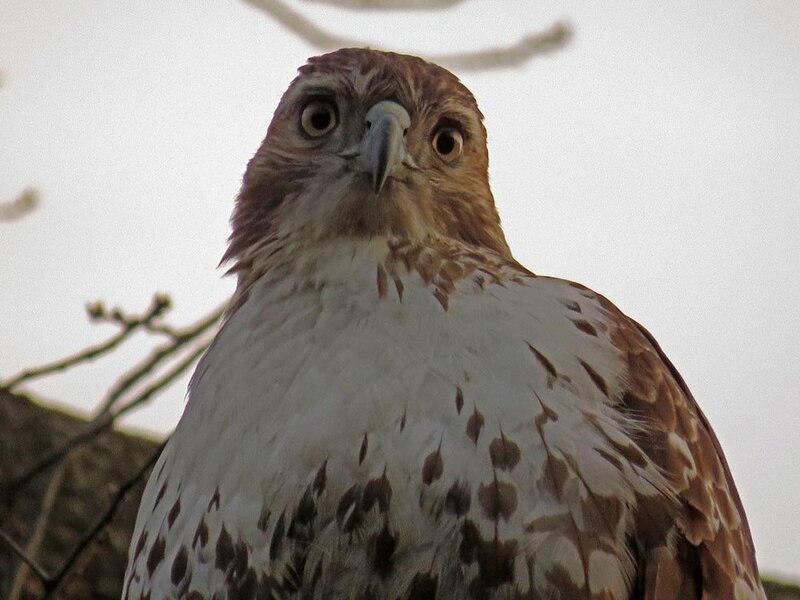 The hawk was definitely ready for lots and lots of closeups. 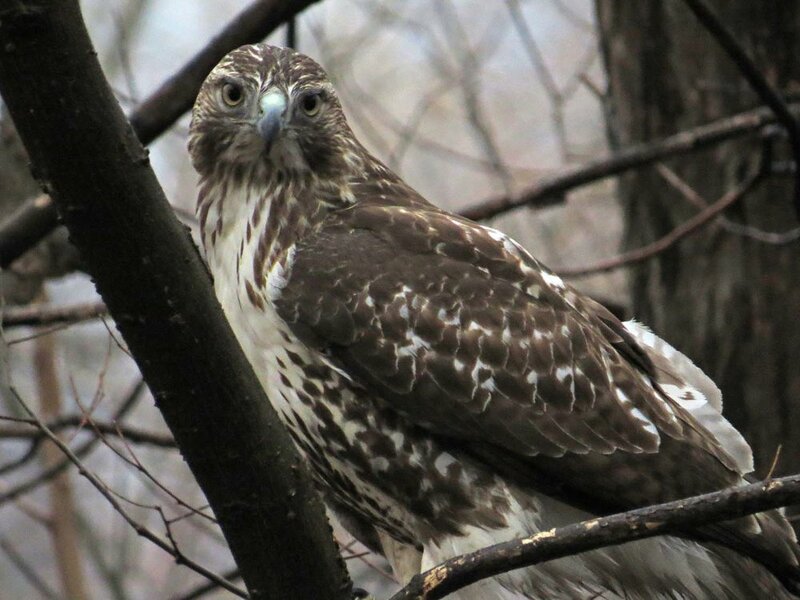 Central Park has been providing food and temporary residence for a number of first-year and young-adult red-tailed hawks so far in 2017. 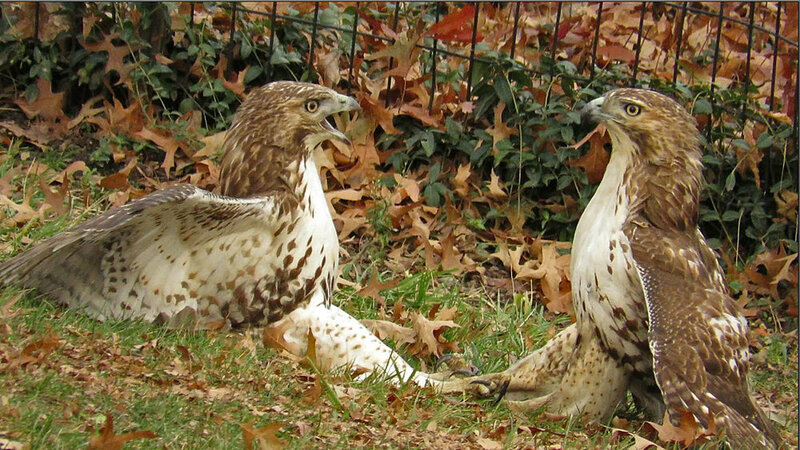 The result: a new series in the Chasing the Hawks in Central Park grouping. The Hawky Near Year! series can be found in the Hawky New Year gallery. Two of the series are below, but check out the gallery! These photos are from Jan. 1-10, 2017. The last photo is of a squirrel in the Ramble, who cried and cried from his hole in the tree because the hawks were overhead. These photos are from Part 2: Jan. 11-12. Photos from Jan. 13 and 14, with so much fun on the snow day! 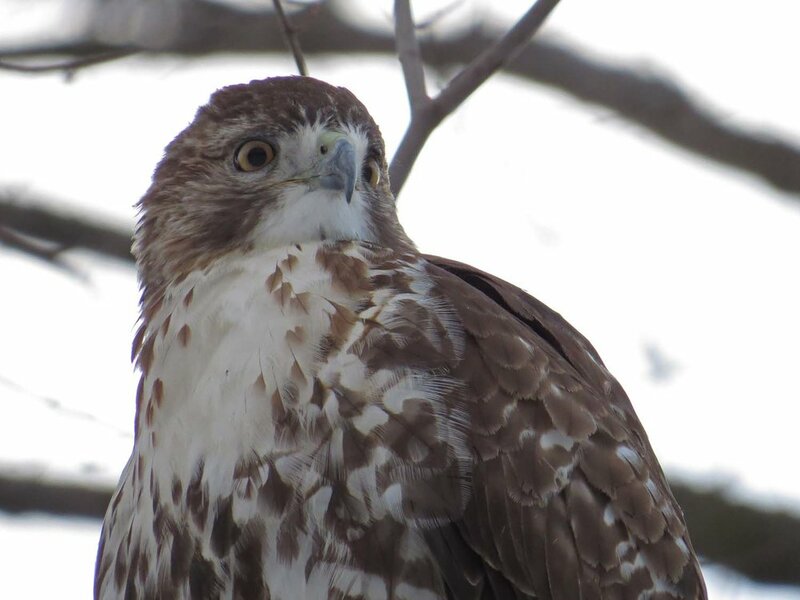 The Jan. 15 video shows a first-year red-tailed hawk dining at Bow Bridge. 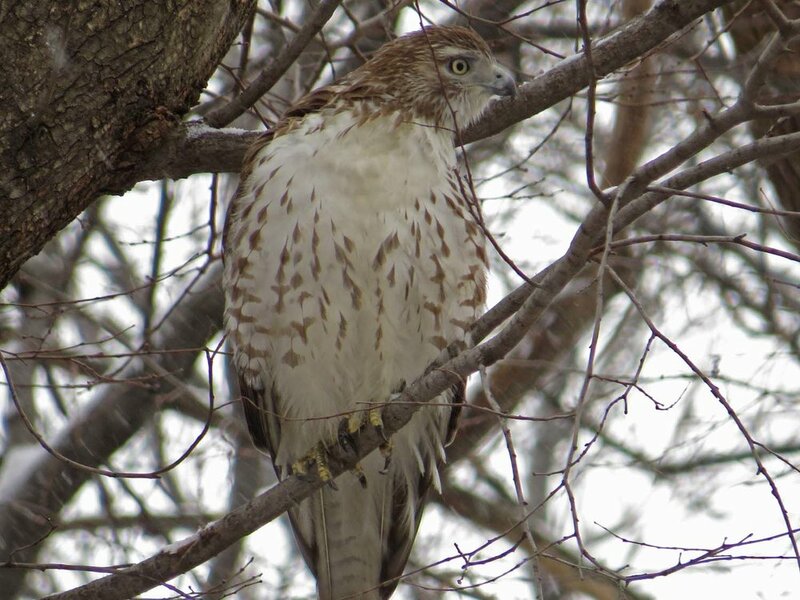 The last three photos show a second red-tailed hawk in the Ramble on the same day. This grouping has photos from Jan. 16 and 17, 2017. 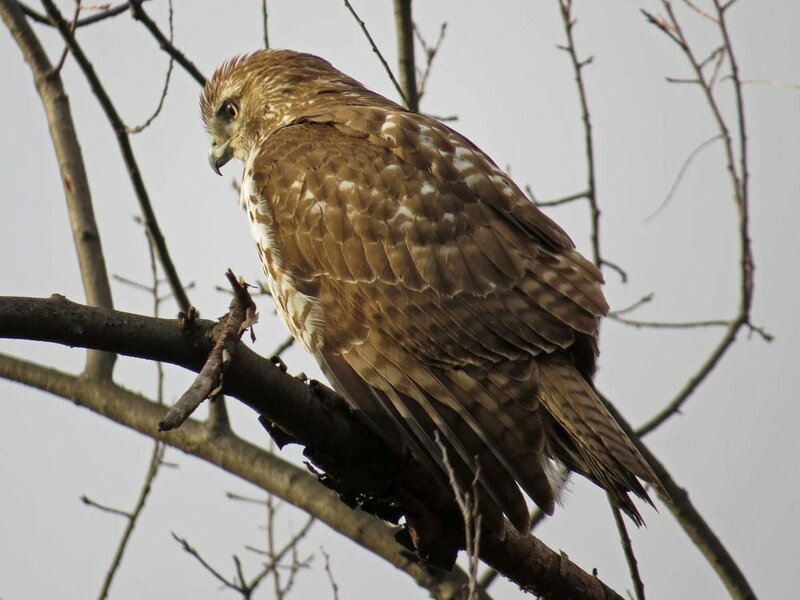 The first photo is of an adult red-tailed hawk, probably Ginger, at Strawberry Fields. The rest are of youngsters. These photos were taken Jan. 18, 2017. 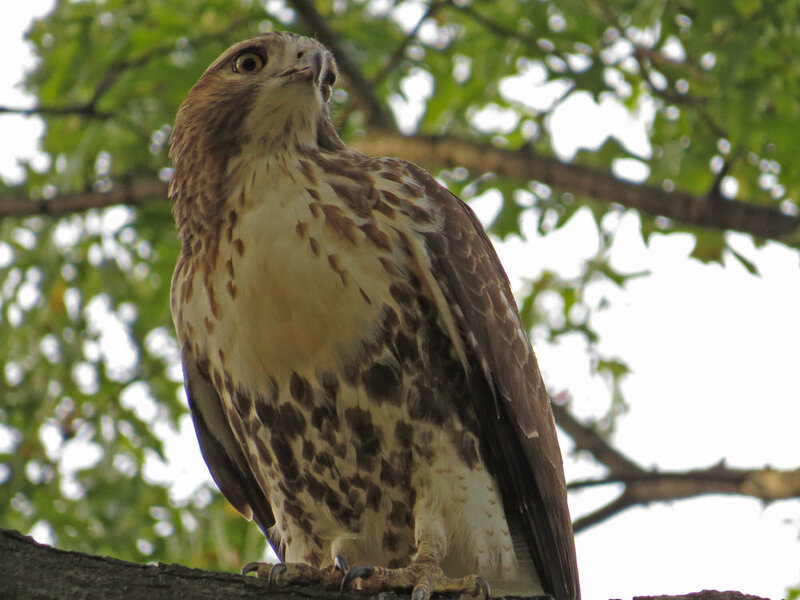 The first two are of a young red-tailed hawk at Bethesda Fountain. 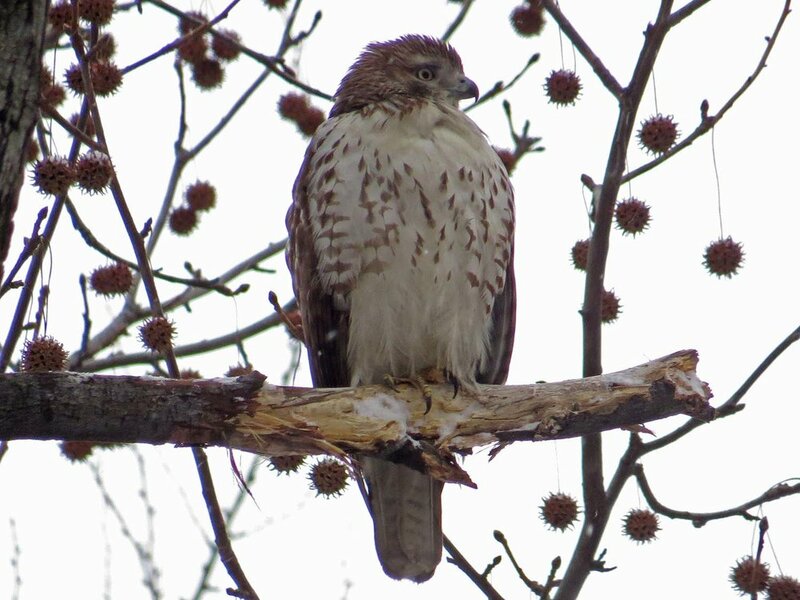 The next photos are of a first-year hawk in the Ramble before and while dining on a squirrel. These shots are from Part 8, which covers Jan. 23 through Jan. 26, 2017. 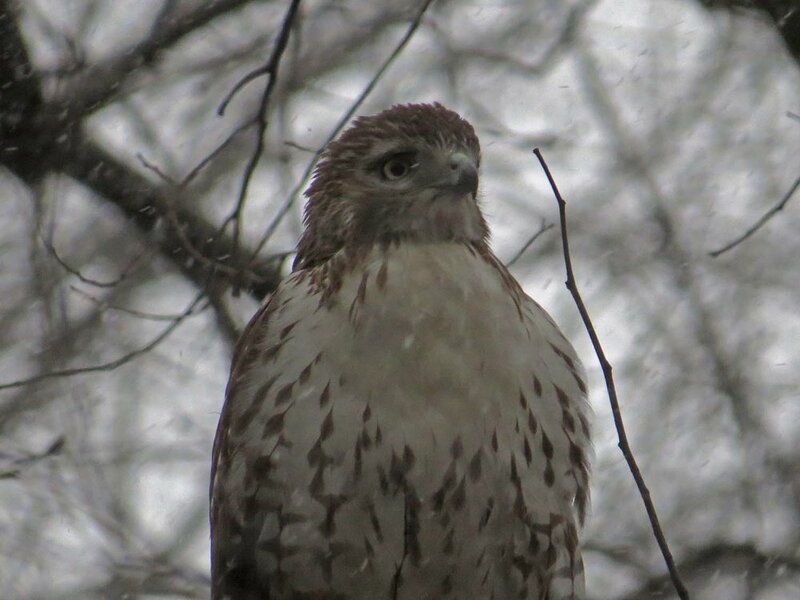 The first shot below is of the adult red-tailed hawk, possibly Octavia, seen in the rain on Jan. 24. The other shots are of the "kids," on Jan. 23 through Jan. 26. Part 9 covers Jan. 27 through 29, 2017. The photos of Pale Male are on the Pale Male page. 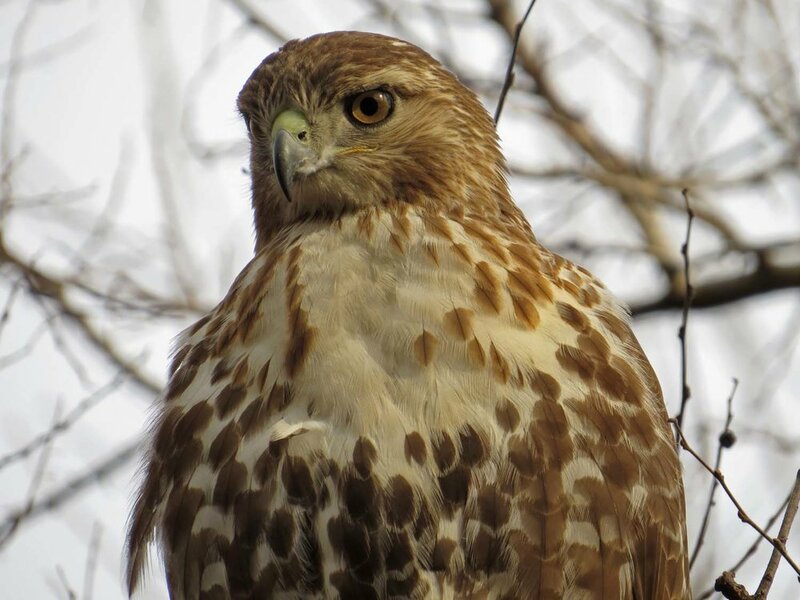 These photos are of the first-year hawks that were hanging out throughout the park. These photos are from Jan. 30 and Jan. 31, 2017, and are part of Part 10 of the Hawky New Year! series. Jan. 30 was a very sunny day; Jan. 31 was a delightful snowstorm. Christmas Day 2016 was a great day with a young first-year hawk. We chased the kid around the Ramble, before finding Octavia and Pale Male near the Met Museum. The video can be seen in the blog posting for Jan. 3, 2017. This gallery shows the kid. 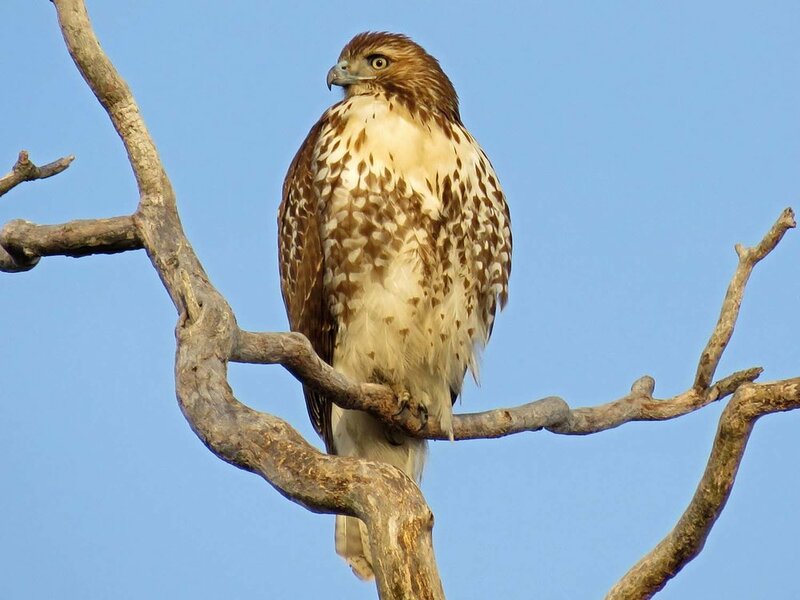 Nov. 10 through 13, several red-tailed hawks graced us with their presence. 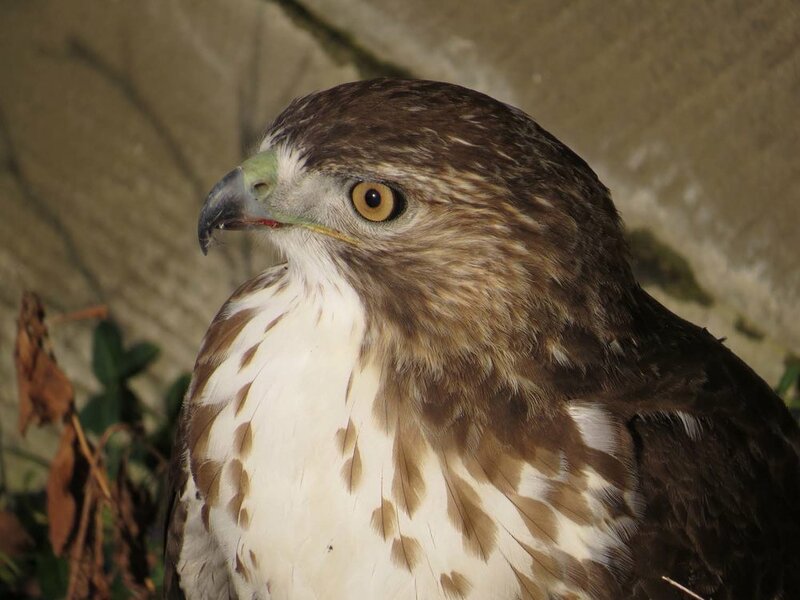 There were two first-year hawks visiting, plus a young adult red-tailed hawk hanging out near the Bandshell. A number of our resident adult were flying high over the park. Lots of video opportunities and photo ops, too. The first-year hawks. The first two shots are from the Mall; the rest are a first-year eating a squirrel (grabbed when a Cooper's hawk dropped it) near the Boathouse. 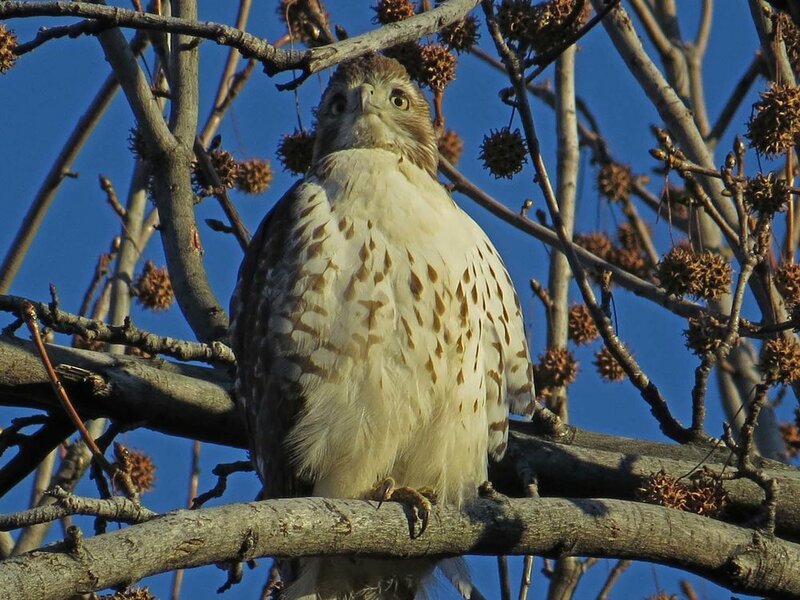 The young adult hawk seen on Nov. 12 and 13. 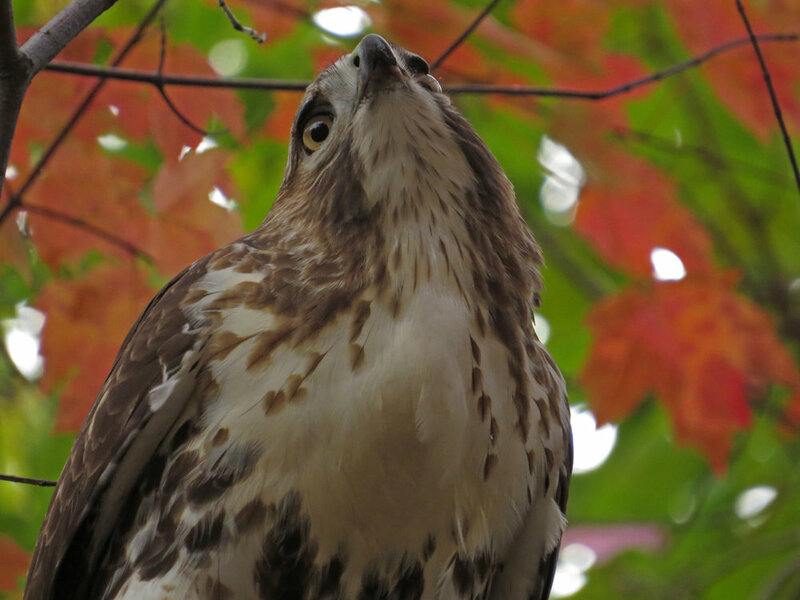 A young red-tailed hawk visited Bethesda Fountain on Oct. 26, and then Laupot Bridge Nov. 2. It was probably the same hawk you'll see in Two Youngsters at the Bandshell and A Young Visitor at Laupot Bridge, both below. A squirrel was crying around 3:15 on Oct. 28, 2016, on the west path leading down to Bethesda Fountain. 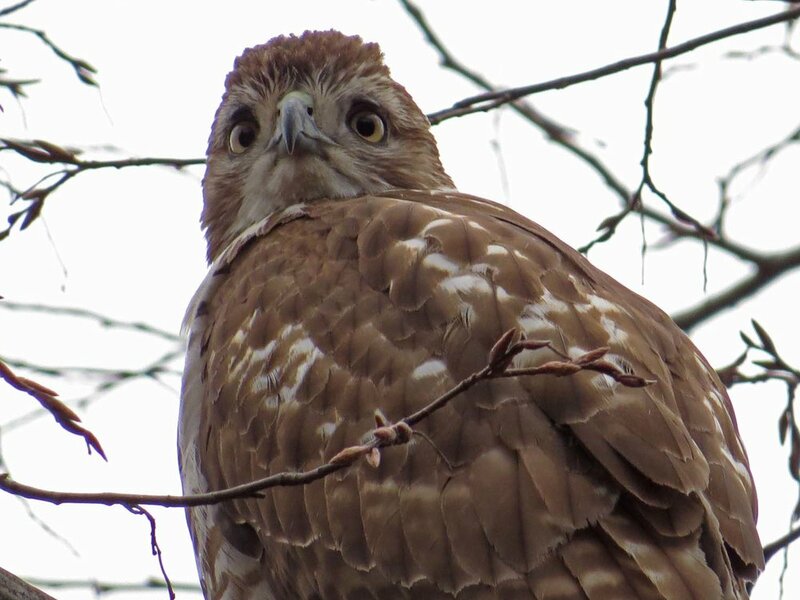 I had been looking for the two first-year red-tailed hawks we saw earlier that week, but despite the plaintive sounds from the squirrel, I couldn't find a hawk. Around 5:15, we went in search of the kids again, and coming to the same tree, we found the squirrel a little lower, still very, very nervous. 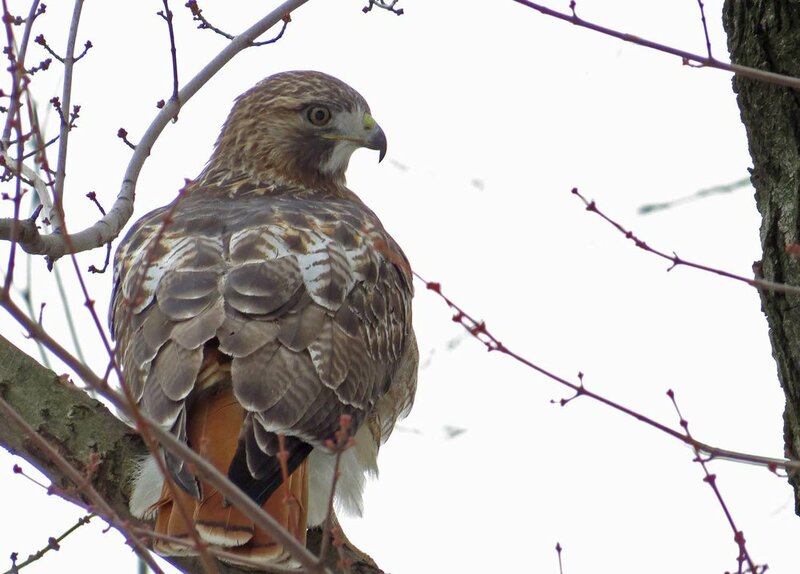 Going farther up the path, a red-tailed hawk, with a red tail, was spotted in a tree over Terrace Drive. The hawk took off for the tree on the west side of the balcony, and then flew down into the ivy after a rat. Oct. 23, 2016, we saw two first-year hawks, plus Sheep Meadow Mama and Octavia. The two kids looked very similar, and we wondered if they were siblings. 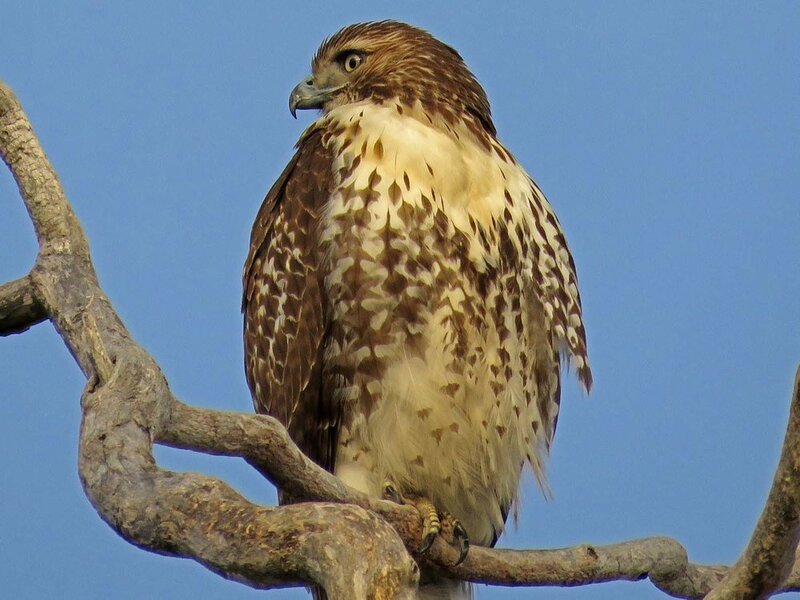 On October 3, 2016, we spotted a juvenile red-tailed hawk just north of Laupot Bridge. It was a brief sighting, but I wanted to document the visitor. There's a short video and three photos. More hawks can be seen on Red-Tailed Hawks 2, a continuation of this page.